The book of Romans was written to explain the Gospel so that anybody could understand it. Paul, the writer, made it so simple that you'd have to have somebody help you to misunderstand it and unfortunately, we've had a lot of help! That is a radical statement. This word "gospel" in the original Greek is a word that was seldom used at the time this was written. Nobody talked this way, because the word literally means nearly too good to be true news. It referred to news that was so awesome, nothing really justified using it. Nothing was nearly too good to be true. Paul said he was not ashamed of the Gospel. Why? "For it is the power of God unto salvation to every one that believeth; to the Jew first, and also to the Greek." The Gospel is the power of God, and that's talking about grace. Acts 20:24 and Galatians 1:6 both use the terms "gospel" and "grace" interchangeably. It's saying that when you understand the Gospel, or the grace of God, it will release the power of God into your life. That's huge! is revealed from faith to faith" means. You receive the righteousness of God by grace through faith (Eph. 2:8)! God won't withdraw His power because of sin in your life. That's why it's nearly too good to be true news. When you talk like this, people with a religious mind set immediately say, "Well, what about sin? This sounds like you're just giving people a license to sin." Not so! Last I checked, people were sinning without license! I'm not advocating sin, but, this is the immediate reaction when you start talking about righteousness by faith. They think you need to make people aware of their sin and the wrath of God. We aren't called to convict people of their sin but to convince them that the only way they can obtain righteousness, or right standing with God, is through putting faith in what Jesus did for them, not through something they've done. That's why I spend so much of my time on this and it's what many of my teaching materials are devoted to. This is a powerful parable. Let me ask you; are you like the Pharisee or the publican? I'm not talking about your actions but your trust. Do you trust in what you do for the Lord or what He has done for you? If a person is putting faith in all of their religious acts - all of their holiness - then that will actually block them from righteousness and relationship with God, but the person who maybe hasn't been as good, yet has humbled themselves and cried out to God is the one who enters into right standing with God. It is offensive to people, particularly if they have a lot of holy actions to their names, when you tell them that all their good deeds don't make them righteous before God. Then when you tell them sinners who only put faith in God are more righteous than they are (Matt. 21:28-32), that really makes them mad! We need a Saviour! The only thing we have to offer is faith. We just believe the nearly too good to be true news that Jesus died for us and paid a debt we couldn't pay and gave us a righteousness we couldn't earn. It's faith righteousness! It takes a supernatural revelation by the Holy Spirit to be able to understand this, but once you do, it will transform the way that you view God, the way that you relate to God and the way that you receive from God. The Gospel is the power of God unto salvation. I encourage you to just humble yourself and ask God for a supernatural revelation of this truth. It's tremendous. Jesus said you shall know the truth and the truth shall make you free (John 8:32). It's not truth that sets you free; it's the truth you know that sets you free, but before you can know it, you've got to hear it. Faith comes by hearing and hearing by the Word of God (Rom. 10:17). That's why I have a lot of materials on this to help you. I have a Bible commentary that will take you through the entire book of Romans, called the Life for Today Study Bible and Commentary: The Romans Edition. It's a spiral bound book with all the scriptures from the book of Romans along with my footnotes, references, and parallel passages. I also have a book and study guide that deal exclusively with the subject of grace. They're called Grace, the Power of the Gospel. 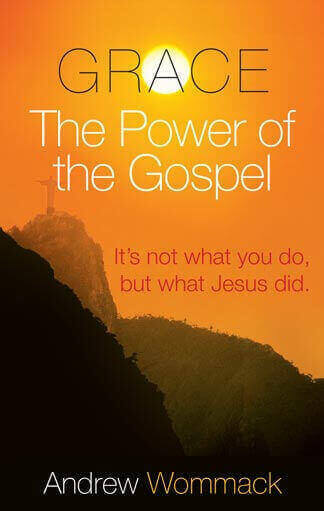 This teaching is also available as CD and DVD albums, but the CDs and DVDs are titled The Gospel: The Power of God. This month, I'm offering them all together for ÃƒÂ‚£30, which is about half the normal price. Please call our Helpline: +44(0)1922 473300 or go online: www.awme.net today to get these materials for yourself or for someone you know. Your life will be changed! P.S. Our construction project at The Sanctuary in Woodland Park, Colorado, is scheduled for completion in November of this year. At the time I'm writing this, we are up against a deadline of sorts. We have to order all the furnishings and fixtures ninety days out, and I've committed to doing this debt free. We need a huge influx of finances this month. We could sure use your help to keep everything on target. I believe it will be done on time and debt free. Thanks for your part in this. It's changing lives forever.